There are few publishing ventures as wonderful as the Viking Portable Library. While the Modern Library, for a long time offered low cost hardcover classics, they were all separate works. But in the Viking Portable Library, you could sum up great authors in the scope of one book. If you followed the wits of the Algonquin Round Table, you know that Alexander Woollcott often got the short end of the stick (he was savaged as the lead character in The Man Who Came to Dinner and when he looked at one of his own books and sighed “Ah, what is so rare as a Woollcott first edition”, Franklin Adams quickly replied “A Woollcott second edition.”). But in the first part of World War II, remembering his days as a soldier during the first World War, Woollcott decided to put together a book of pieces from various American authors for servicemen to read. He proposed it to his publishing house, Viking. It would be hardcover (a flexible hardcover for durability and making it easy to put anywhere), but also small, compact, though with a lot of pages. They had light paper and small margins, but were compact, and most of all, portable. After all, they were being designed for soldiers. There is a good introduction to the Viking Portable Library to be found here, though there are some mistakes (not all the first dozen drew from Viking works and Sanctuary was never out of print, though it was the only Faulkner title in print at the time of the Portable). The Portables grew quickly. By the end of the war there were already a dozen, including Hemingway and by the end of 1946, there were 27, including Fitzgerald, Twain, Woollcott himself, and of course, Faulkner. 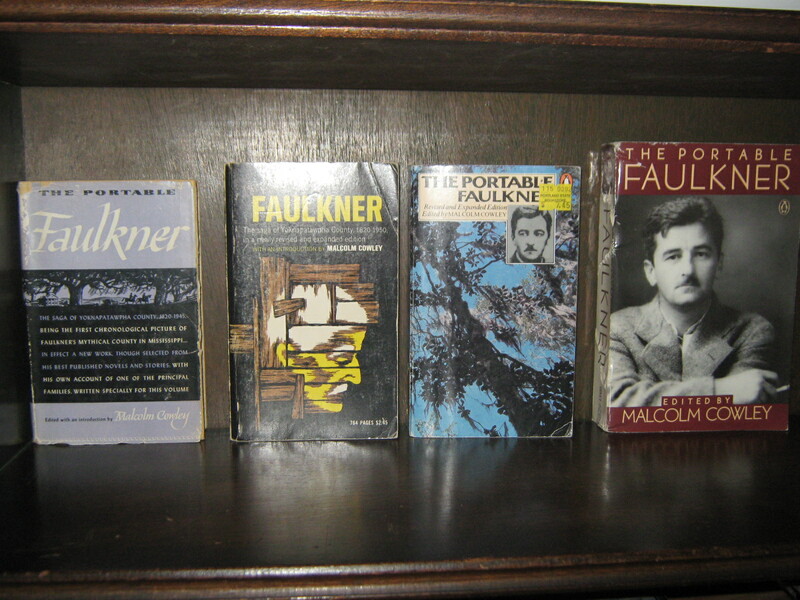 The Portable Faulkner is one of the most famous and for good reason. 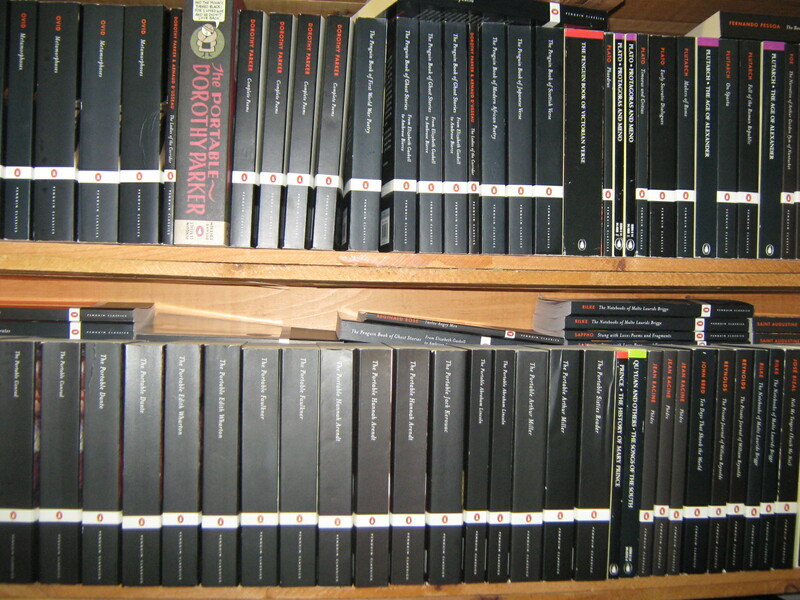 When Malcolm Cowley put together the Portable Faulkner, all of his books except Sanctuary were out of print. He was working in Hollywood and hadn’t put out a book in four years. But the Portable Faulkner revitalized his career. It showed the whole scope of the best of the American writers and allowed people to truly understand his place in American fiction. Just a few years later, he won the Nobel Prize, making him the first Nobel Prize winner to be in the Portable collection (the next three Americans to win the Nobel Prize all also had Portables – Hemingway, Steinbeck and Bellow). The initial burst of authors had been American and the only 2 of the first 20 who weren’t were British (Shakespeare and Wilde). The first foreign language author came with #21 – Rabelais. But the focus was still mostly English language writers. Numbers 49 to 53 had been a series of Poetry of the English Speaking World and then there had been, mysteriously, no #54 that I have ever been able to discover. After The Portable Nietzsche, #62 in the series, things began to change a little. It was 1955 and the Portables stopped being printed in the flexible hardcovers. They began being printed in paperback. The start of the paperbacks began a new direction for the Portables. Initially, only 10 of them were printed in paperback (Whitman, Twain, Rabelais, Lawrence, Dante, Hawthorne, Greek Reader, Voltaire, Medieval Reader, Gibbon) — all of them well beyond copyright protection except Lawrence. By this time, several of the original group of Portables had gone out of print and never ended up being printed in paperback. These included the now hard to find Portable Hemingway and Portable Fitzgerald. To get either one with a dust jacket can easily run into the high double digits (ironically, Fitzgerald is also the author of one of the hardest to find Modern Library books – The Great Gatsby). It is not a coincidence that those two writers, along with Thomas Wolfe, were Scribners authors. In 1952, Charles Scribner III died and his son took over the publishing house, and he brought many Scribners authors books back into his own house and out of their reprint licenses. The other books never to appear in paperback included most of the odd early collections, including As You Were. The other major difference was the great slowing down of new titles. While in just over a decade, the series had grown to #62, in the next fifteen years they barely grew at all and by the end of the sixties they were only up to #68. They did start revising older versions, though. While The Portable Steinbeck had been revised as far back as 1946, the sixties saw revisions for Faulkner, Joyce, Thoreau and Dante. All of these were in the new paperback versions, with a Viking ship on the spine, with a number on the sail. This remained the style until 1975, when Viking was purchased by Penguin Books. While the advent of the ISBN system in the late 60’s and early 70’s meant that some of the books with the sail on them began to have ISBNs (all the ISBNs matched the numbering system – they began 014015 – the next three digits were the catalog number – for instance 018 for Faulkner – and then the check digit; for the books that were no longer made, that ISBN was simply never used – thus while the Portable Woollcott, had it still been in print when the ISBN system was established would have been 014015017X, instead there is no book with that number), now the books were redesigned. The sail was abandoned and instead, on the spine, was a small penguin with the ISBN just above it. By this time, they were up to P79 (the catalog number before the advent of the ISBN was a P followed by the number), although for some reason there was no P72 and that ISBN has been skipped – perhaps there was a Portable planned that got deleted. After this, the numbering is tracked by that three digit stretch in the ISBN. Under this system, the numbering would eventually grow to 107, though there would be some irregularities (several numbers are skipped and four of the numbers in the eighties were assigned to a four book series called the Portable Library American Literature Survey). They also started to give out new numbers to later editions, rather than releasing revised versions with the same number. To this end, Dorothy Parker, Sherwood Anderson, Walt Whitman, Geoffrey Chaucer, Oscar Wilde, Ralph Waldo Emerson and Vladimir Nabokov would all end up with two different numbers. We also ended up with non-portable titles with the same content as the Portables. Thus, I own the Penguin Dorothy Parker, which is the same book as the Portable except for the title and ISBN and The Portable Nabokov was identical to the previously released Nabokov’s Congeries. The design also began to change again. Starting with #91, The Portable Tolstoy (published in 1978), the covers were changed to a different type of cover – usually blue, with a consistent spine that said The Viking Portable Library at the top, followed by the author and then an ISBN with a penguin surrounded by an orange circle at the bottom. This version lasted through the eighties and by the end, we were up to 100. Then the Portables became considerably less portable, with the books now being printed in trade paper size. It allowed for a better binding and the books stayed together better, but they were not quite the style that was originally intended. The numbering also stopped with #109 (The Portable Darwin, published in 1993). New portables in this large white design continued to be published throughout the nineties, but there was no system to the ISBN’s. Finally, one more redesign was added after the millenium, with the Portables becoming consistent with the current Penguin Classic design, with all book spines and designs. This hasn’t stopped the publishing cycle and the most recent, The Portable Charles W. Chesnutt, was published in 2008. To get a good idea of the various covers through the years, you can go here, though they make some odd choices of the main cover to show and the list is incomplete. 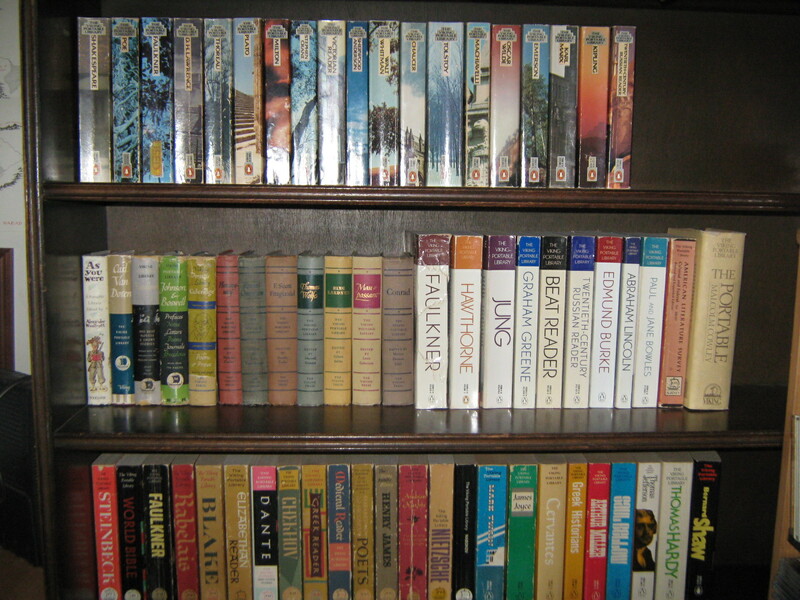 Many of the Portables are now out of print, though they are easy to find at many used bookstores. And many of them are still in print and easy to buy or order from any decent bookstore. Some bookstores even keep them shelved together (in the Boston area this most notably includes Bryn Mawr Books, a used bookstore which shelves them all together and New England Mobile Book Fair, which shelves things by publisher). They are still a great way to collect classic texts. With many of these authors, you wouldn’t need any of their other books and with others, they serve as a great introduction. They of course, serve the whole course of literary history, beginning with the Greeks and including many of the greatest writers of the 20th Century. Interestingly, though, there are some glaring omissions. For a long time, Chekhov was the only Russian writer included and there is still no Dostoevsky. Nabokov, Greene and Bellow are all in the catalog (though only Greene is still in print), but Philip Roth and John Updike are notable omissions among the great late 20th Century writers whose work easily adapts to such a style (presumably because of licensing issues) and no list of great writers would be complete without Camus, Kafka or Virginia Woolf, none of whom are included. My current goal is simply to get one of each. I don’t care about dust jackets (some of the early titles are quite expensive if you want a dust jacket), don’t care about the styles (I prefer the sails or the eighties design, but I’ll get what I can and because of when they were in print, several of the titles are only available in one style) and don’t feel the need to get different versions if they have been revised. When put in a spreadsheet, there are 121 of them and I have 77 of them, with another 10 eliminated because I have a different version. That just leaves 34 to get. 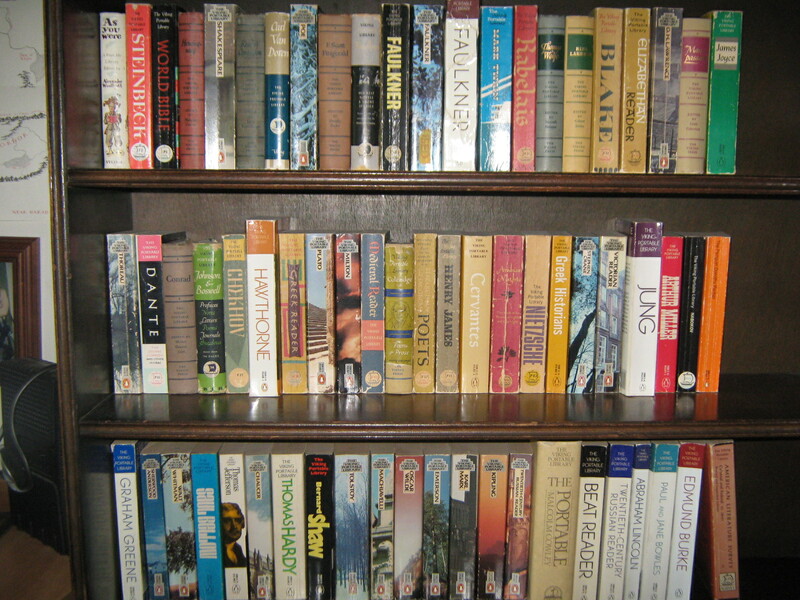 There are essentially five styles – the hardcover, the sail, the penguin (blue cover), the white trade (all four of these are faced out in the Faulkner picture) and the black trade. There are a few variations (the penguin with the ISBN and a few of them were printed in a hardcover version later in the print run — apparently they were licensed to Random House to do these print runs, either as remainders or for schools). Of the titles I have, they break down this way. I don’t have any of the black trades yet, but the last few titles are only available in that style, so eventually I’ll get some. And if the numbers don’t quite add up that’s because I have 4 different versions of the Portable Faulkner (of course I do). Anyway, here is the printing history for the complete list. By the way, I have no idea how and why they decided that some writers should have their first name included in the title and some didn’t need to, but I have gone with what they list. It’s hard to find much written about this series in spite of its long glorious history (and especially its place in Faulkner’s history), which is why I have expended so much energy on this post. Hopefully I can inspire some people to collect a truly great set. This is what bookcases are for. To hold sets like this. The titles listed in bold are titles I have in format or another. Those that have links are those currently available through the Booksmith. It is not a definitive list of those that are currently in print, but it is close enough. Excellent article. I’d be interested to know if the original 1940s hardback versions were lighter than the paperback ones, due to thin paper and small typefaces. Any chance you can weigh your different Faulkners? The paper wasn’t as thin by the time they did Faulkner (the war was over), so the original hardcover is slightly heavier (or it feels that way in my hand anyway). Thanks for the article! I’ve been collecting Viking Portables for years, much to the amusement of my friends. Though difficult to categorize, I’m also fond of Viking Portables that have been rebound for Public Libraries. Tough and sturdy, great for throwing into a knapsack. Have you ever run across any vintage promotional materials from Viking? I know Modern Library had specially made display cases for their books, I wonder if Viking ever did such a thing? Ah well, nice to geek out with another collector. I’ve never see any Promo stuff. There’s not as much info available about the VPL. I have seen pictures of the Modern Library bookcases. They are one of my dream purchases. And since I did the article I found the other four poetry volumes, first editions all, in a bargain used bookstore here in Boston. A wonderful find – the only one they didn’t have was the one I already had. I actually saw a Modern Library bookcase in San Diego. Can’t remember the name of the used bookstore, but it’s a charming one downtown. The bookcase was upstairs and was stocked with plenty of used Modern Library editions. It’s funny, I bought my set of VPL Poetry editions in Boston. I paid a lot for them too. At the time they were rare too me, but of course I see them all the time now. I wish there was more information on the editions that were never produced. It would be interesting to know what was planned for #54. In a funny way it’s a mystery edition. Lame joke I know. You should check out the Strand in NYC, perhaps just using the website. They usually have lots of Portables in all 5 designs, even hardcovers with dustjackets [not necessarily mint, of course]. Great article and information, thanks! If anything is a classics in a series like this one, I want to collect it, unless perhaps I have the work by another publisher. I’ve also collected Viking Portables for years and I think I have all except Arabian Nights and 3-4 others. My favorite format is the early flexible covers. I don’t think the Portable Petrarch was ever actually published. I’ve been looking for it since 2005 and it’s never shown up as available anywhere. Thanks for the great article – I was looking for a cover of Johnson & Boswell for my LibraryThing site and your blog came up! I’m also a longtime collector, going back to my college days when I worked in a used bookstore. Unlike you, I’m particular: I only like the hardcovers and I have to have dust jackets. Currently, I have 37, including the complete Poets of the English Language (all in DJs with severely faded spines, and all 1964-65), Hemingway (second printing), a nearly mint-condition Woollcott, and one paperback: the Medieval Reader, which I found in a store with a nice, bright colorful cover, so I put it on the shelf. My collecting actually started with volumes of the Modern Library my mother had used in college. These fill the bookcases in my study, but the Vikings have their own place of honor. Thank you, for the link to this article via LibraryThing. I thoroughly enjoyed it. The history of the series’ creation was especially interesting. I started collecting the series when I was in college in the early ’90s and over the next several years amassed over 50 of the titles, most in like new condition. Not only did the format appeal to me, but I was enamored with the design the series used for titles published or reprinted during the ’70s and ’80s- the color wrap around photo with the author’s portrait inset on the upper right front cover. The current design for Penguin Classics is lackluster, but the predominantly black spine and cover with the emaciated type for title and author’s name is a shabby exterior for the Portable legacy and more than disappointing. Then again, there seem to be so few titles reprinted in the series now that I suppose a unique Portable design doesn’t matter much. Of my prized collection, I must confess that I have let a few slip away, but the current roster is 47 strong. All but one have the preferred design mentioned above except for one, The Portable Johnson & Boswell, which I believe was published in 1947 and reprinted into the early ’60s. If I get the urge someday, I might start collecting duplicates from this period- with design and illustration typical of that period and superior to book design in general today. About a third of my collection were found in used bookstores in Oklahoma City where I grew up and lived for several years. The rest were picked up on random road trips and vacations from coast to coast with one find in Toronto: The Roman Reader (I have a feeling my memory is not so unique among bibliophiles in this regard). My collection is currently shelved in a barrister bookcase in doubled rows to make space for my other book series obsession… yes you guessed it… The Modern Library. I have more windy commentary about my ML collection but shall spare you… for now. Oh just one more thing to illustrate my obsession for the halcyon days of Viking Portable. Sometimes when I can’t sleep at night, I imagine titles that could be great additions to the series if only Penguin had the sense to come knock on my door and offer me the job. Here is a shortlist of portable titles I would love to edit/publish. I have thirteen volumes in the series all of which are paperback reprints from the early Eighties except for the one I treasure the most: a hardcover copy of Whitman with dust jacket from 1945 which is in very good condition. And a new edition of The Portable Thoreau is out today. Excellent article, thank you for researching this. I’ve been collecting VPLs for some years, and have acquired 61 of the 121. My theory on #54 has been that they left room for a volume of 20th Century Poets. Thank for writing such an excellent articles on these books! I started collecting them when my school library was getting rid of old unwanted volumes, and picked up two Viking Portables. I really didn’t know anything about them until I found your excellent article. For those that are interested, a new edition of the Portable Steinbeck (revised again!) is due out September 2012. Also, a new Portable coming in 2013…Malcolm X! I think that Kevin Sterner’s theory is quite plausible. I have been looking for a complete list for AGES! this is great. I started collecting them when I lived in Berkeley in the 1980 and had access to all its used book stores.I basically collect only the original format which goes up through the renaissance reader… now I’m wondering about the Nietzsche Reader. Is that in the original format or is that the first in the next design? The Portable Nietzsche (first printed in 1954) was available in a flexible with a dust jacket (Google Portable Nietzsche dust jacket and you can find an image), but because the paperbacks started the next year, they are hard to find and probably expensive. Thanks for the article. I’m currently writing my PhD diss on the portables and have found information scarce. You might be interested in hunting down an article by Peter Coveney in the magazine Firsts (Sept. 1092, Vol. 2 Num 9)–it is one of the most thoroughly researched articles I’ve found and he includes images of the early promotional material that he obtained from the Viking archives. I have, finally (after more than 30 years) completed my collection of the first 63 (i.e., “62”, because of #54 the “ghost” title). 54 are ist printings, 5 are 2nd printings and three are 3rd printings; all but 13 have dust jackets. I’m 76, and this is the happiest time I’ve ever had as a book collector. From the begin-ning, what set the Viking Portable Library apart from others like Modern Library, Everyman’s Library, Oxford World Classics, and other lesser series was the diversity of each volume. Not simply a famous novel, each book contained poetry, essays and/or letters, so that each volume was a true ex-ample of the author’s output; each volume had an introduction by a critic or learned scholar. What a treasure trove! No. 16 above, I’ll see your “necro-post” and raise you one “advanced decomposition-post”. I’ve been researching and writing a long piece on the various incarnations of the Portables (Mr Beck’s article here and the Coveney piece in Firsts magazine from back in 1992 are both extremely helpful) and their history. I’ve collected the Portables since the late 80s, almost accidentally at first, when I was in college, like some other commenters. I initially preferred the wrap-around photo cover versions, but broadened my tastes as time went on. I really got into them again after finding four of the five volumes of the Poets of the English Language, in chipped jackets, at a second-hand bookshop in Rogers, Arkansas. I’m curious to know if anyone knows anything about the knock-off Portables published from about 1949 to 1952. They were called “The Indispensable [Author/Subject Name Here]”, and were published (apparently under license) by a book club (?) called just “Book Society” in New York. By my count on second-hand book sites like ABEbooks, there were about 35 published, in hardcover, without dustjackets but *with* glassine wrappers and slipcases. I’ve never found any promotional materials on them. Anyone know anything about them? Also, for what it’s worth, I have a working hypothesis about the missing No. 54 for which I have no corroboration at all: has anyone else encountered the boxed set of the Poets of the English Language? The five volumes have uniform blue and gold binding (instead of the regular red & beige), and were apparently issued without dustjacket, boxed together? I found this set on eBay earlier this year and bought it with a shrug, not knowing what it might be. It seems to have been published at the same time in the US as the volumes in jackets, and wondered if it might have been issued as the elusive No. 54. However, I’ve found no other corroboration of my (almost certainly incorrect) idea, and the Portable Henry James, published almost a year later as No. 55, makes no mention of a boxed set in the list on the inside of the jacket. Any collectors out there with any thoughts? Feel free to drop me a line. Some years back, I had a James Joyce in that series. It was identical in every respect (in terms of text, layout,etc, to the Viking Portable Joyce, except for outer packaging: cover, slipcase. My understanding was that they were Viking Portables licensed to a Canadian publisher.